Barbados Free Press 2nd Print Edition Hits The Streets! How does a blog publish a paper edition throughout the country and the world? Easy! We publish the print edition online as two .jpg files that our readers can print at home or work. Hand them out to your classmates. Put them in the toilet stalls at work. Leave a few on the ZR seat when you reach your destination. When no one is looking, put one on the restaurant table next to yours – then watch the fun! … or, as one very creative BFP reader did last time – insert the BFP print edition into each Nation News or Barbados Advocate stacked at the store counter! This issue we feature two important stories that Bajans have never heard mentioned by the government-controlled Barbados media. 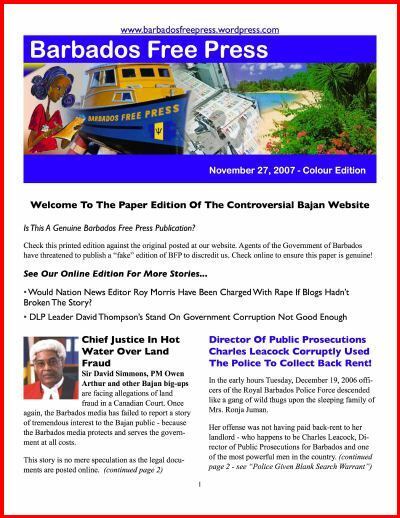 Barbados Free Press readers are familiar with these two important news stories that are supported by court documents posted on the internet at Barbados Free Press and Keltruth Blog. The truth about political corruption and abuse of position by Bajan big-ups needs to be told, and if the Barbados news media won’t tell the stories out of fear or complicity with the government, then ordinary citizens will tell other citizens about the goings on. If each one of our readers prints and distributes just five copies today, we can have 25,000 to 35,000 BFP news flyers on the streets by tomorrow night. If we all did that each day this week, over half the population would have a copy in their hand by Sunday. So fire up those inkjets folks! Last time we received an email from a Ministry staffer who loaded up the laser printer when the boss went for a three hour lunch. Now that’s what we call initiative! Just what you need to create a one page flyer printed front and back. 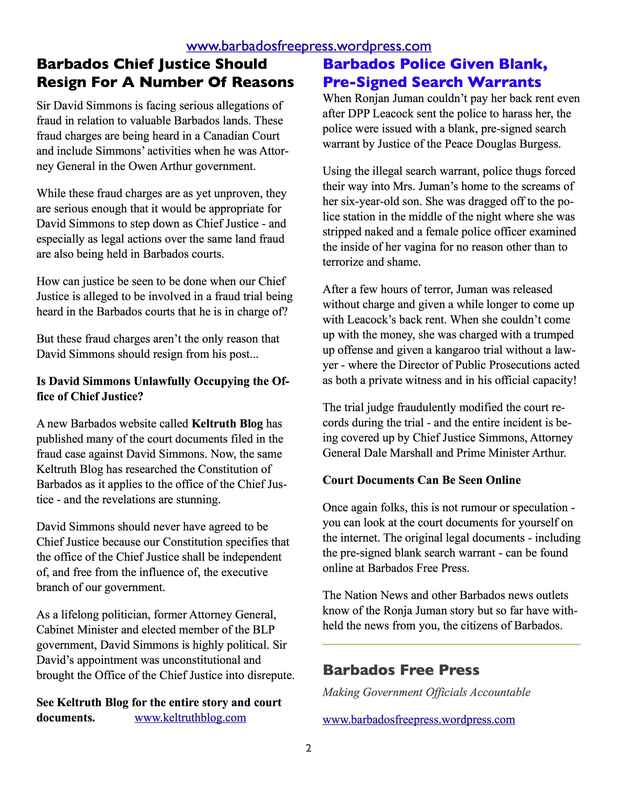 BFP Nov 14, 2007 – Business Dealings Of Barbados Chief Justice Sir David Simmons Exposed On Keltruth Blog! BFP Sept 24, 2007 – Barbados Director Of Public Prosecutions Charles Leacock – Ordered Police Thuggery Over His Tenant’s Unpaid Rent – Night Raid, Woman Strip Searched Over Unpaid Rent! Steve Fossett’s wife Peggy has asked a court to declare the missing aviator as dead. Fossett went missing on Monday September 3, 2007 over the rugged mountains of Nevada while on a pleasure flight. No matter how much the aviation industry tries to enhance safety, nothing can change the fact that flying is inherently dangerous. And every so often when a superb pilot like Steve Fossett goes down we become a little sharper with the checklists, and a little more focused on risk mitigation when we fly.